Though we knew it was coming, it was sad to hear of the death of Glen Campbell at 81. His long bout with Alzheimer’s was brilliantly depicted in the sometimes painful 2014 film “I’ll Be Me,” which millions saw through replay on CNN (when that network had the luxury to show documentaries). Campbell began as a session guitarist, appearing on records of Frank Sinatra, Rick Nelson, the Monkees, Elvis Presley, the Champs, the Hondells, Dean Martin, Johnny Cash and the Mamas and Papas as well as several of Phil Spector’s groups. When Brian Wilson first quit the touring version of the Beach Boys in 1965, Campbell filled in for a few months on the road but turned down an offer to join. His first Top 50 record was a cover of Buffy Sainte-Marie’s “The Universal Soldier.” His first hit, “Gentle on My Mind” in 1967, became his theme song. He hit three times with Jimmy Webb compositions — “By the Time I Get to Phoenix,” “Wichita Lineman” and “Galveston” — all great songs. His first No. 1 pop song was “Rhinestone Cowboy” in 1975. His only other pop No. 1, “Southern Nights,” was written by Allen Toussaint. He hosted two different TV shows, where his appeal was on full display, bringing bluegrass into the mainstream and easing pop and rock and roll to an older audience. 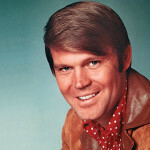 My mother always compared my brother’s looks favorably to Glen Campbell (and mine to “something the cat dragged in”). Campbell starred in movies such as the original “True Grit” and “Norwood.” He also lent his voice to the animated movie “Rock-A-Doodle,” which may not be as memorable. He continued to perform extensively, recording the notable “Meet Glen Campbell” in 2008 covering songs by U2, the Replacements, the Velvet Underground, among others. His 2017 “Adios” had covers of George Jones, Roger Miller, Bob Dylan and his old pal Jimmy Webb.